Pronovias Wedding Dresses at Karen Forte in Cambridgeshire. For us, this designer bridal collection is a reflection of diversity with the aim to appeal to every bride searching for their dream dress. The 2019 Pronovias Collection appeals to romantic and classic brides, but also modern & bold women. A collection designed for brides all over the world. Karen Forte are proud premier stockists of the Pronovias collections and have worked with the worldwide renowned designer for over 10 years. There is also a stunning cocktail dress collection you can view here. In short, the background to this family firm begins in Barcelona. Founded in 1922, it has since transformed into a global company. As a result it’s fashion shows and designers attract attention from hundreds of journalists from all over the world. They have become the international reference for bridal fashion. 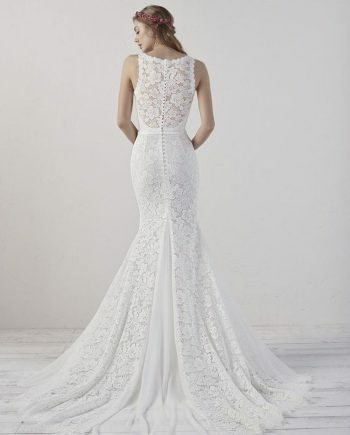 This latest Pronovias Wedding Collection 2019, ‘In Bloom’ is an analogy of blooming gardens. Drawing inspiration from how different elements live in perfect harmony. Understanding every bride is unique no matter your body shape of size with Pronovias you will find the perfect fit for you. One bride. One Shape. One Unique Dress.